« 26.8.11- Home sweet home on 24th…. 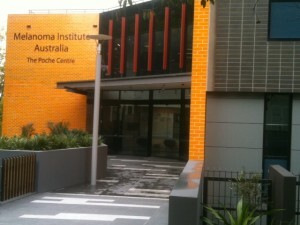 Melanoma Institute Australia Nth. Sydney. I had a whole 48 hours at home after stepping out of the truck late last Wednesday night after completing the 2011 Coast2Coast 4600km horse trek and the massive drive back across this wonderful country of ours with the horses in the truck. 48 precious hours then I flew out to Sydney for a training event with NSW Cancer Council and then Monday afternoon and yesterday meetings with staff at the Melanoma Institute of Australia (used to be the Sydney Melanoma Unit-from which Hannah’s first two ’rounds of treatment’ happened under the care of Assoc. Prof. Andrew Spillane. ) This new facility is magnificent and is a reality because of the generosity of Mr Greg Poche who sadly also lost a family member to melanoma and generously funded $40 million to see the new facility become a reality. This is the largest purpose built melanoma treatment and research facility in the world and it’s right here in NSW Australia! Check out www.melanoma.org.au for further information. Additionally, Jay Allen (campaigning to ban solarium industry in NSW and ultimately Australia wide), himself a melanoma survivor works as a community coordinator at MIA and has a truckload of enthusiasm and drive to spread the word about melanoma and prevention strategies. This may look like a bricks and mortar building, but inside is the genius of Hope housed in the clinicians rooms, the research labs, the blood and tissue banks, the hearts and souls of the admin staff working there, I have never felt so strongly such a deep sense of organisational collaboration, on every level…hope seeps out of the very walls and my friends I am excited about the future of melanoma research and education….. This entry was posted on Wednesday, August 31st, 2011 at 1:24 pm	and is filed under General. You can follow any responses to this entry through the RSS 2.0 feed. You can leave a response, or trackback from your own site. MELANOMA RESEARCH: What is Peter Mac doing about melanoma and skin cancer?